books are such magical things. we can open them and be transported to new worlds, new times, and new adventures. we can laugh and cry and shake our fists along with our favorite characters, and we can fall in love and have our hearts broken with them, too. my ya gothic horror is on submission right now, and i’m in the midst of researching and drafting out my latest project to keep from obsessively checking emails from my agent. i’m also binge-reading a bunch of books and loving every second of this part of work. 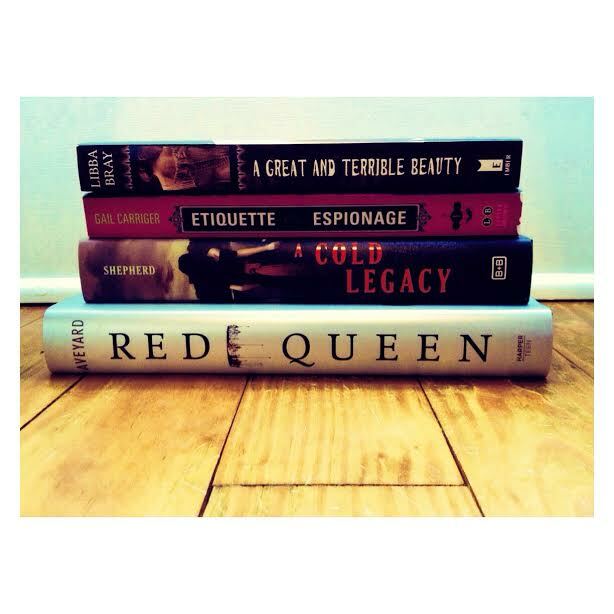 here are a few titles from my recent book haul that i’ve been super excited about reading. omg the gemma doyle trilogy??? where has it been all my life. so. effing. good. i bought the other two books and am eagerly* awaiting their arrival. i cannot believe it’s taken me so long to get into them. what debut are you most looking forward to? and what are some of your favorite creepy books? i need to add some more titles to my (ever) growing list! *by eagerly awaiting i mean pacing back and forth, cursing the mail for being late, and breaking out into a cold, i-NEED-it-now sweat. the next step will be rocking in the corner and smacking my gums until the precious arrives. not pretty. Thanks, but no thanks. (Fake) Rejection letter hell. 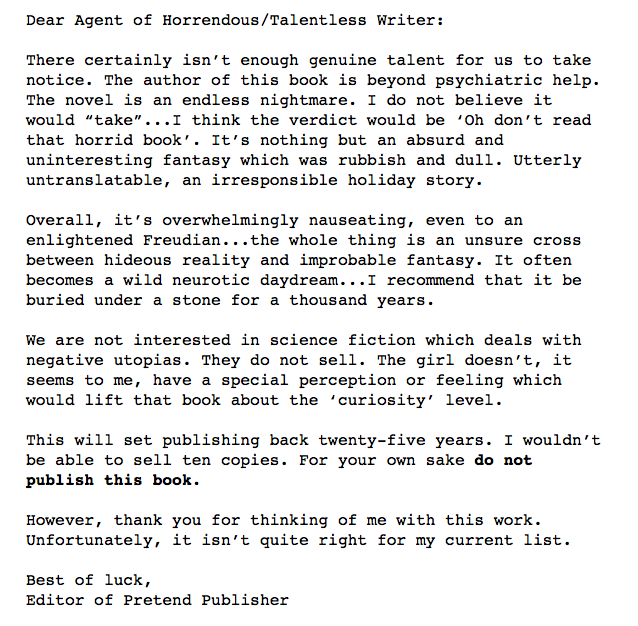 For some road-to-publishing fun, I decided to take some of the most [in]famous rejection letters (sent to UBER famous authors), and combine them into one hellish rejection. Quotes about hope and a song to go along. See what I did there? Throughout a writers career there will be plenty of time to learn the art of patience. TRUST me, you’ll need it. One of the main ways we learn this is through waiting. We wait until our novel is scoured over before sending it to betas or crit partners. We wait for them to return it with notes on what they hate/love/and what needs to die a slow painful death. We repeat. Finally, we start sending that manuscript out into the query world. Anyone who has gone through the process can tell you…you wait some more. You wait for the agent to request your work. You wait for them to read it. In turn, when you DO secure an agent, they’ve got a bunch of waiting they have to do, too. They feel our pain. They wait for editors, publishing houses, etc. I thought I was a fairly patient person before I really started going at writing with the intent to publish. On the bright side, I’m almost so patient now it scares me. Well, not really. If you’re in the waiting game, I thought I’d share some quotes to help pass the time. Enjoy!! I have gotten a few questions about exactly what I’m looking for, so I hope this post helps to answer all of your guest blogging worries. Basically I’m looking for anything having to do with writing. If you’ve come across a quote or poem that has inspired you that works too. If you’ve been published and want to share your story, if you’ve just gotten your 1,000,000th form rejection (okay maybe not a million) and you want to share how you keep yourself optimistic then that’s what I want to hear. If you’ve carved the Martha Stewart of all pumpkins (jack-o-lanterns) and you want to share the picture, then… you guessed it, that works too. The sky is the limit. However, I’d like to keep it positive. So if you’ve received your ba-jillionth rejection and you are fed up with the world of publishing and you’re looking for a place to bash it, then this probably won’t be the best platform. 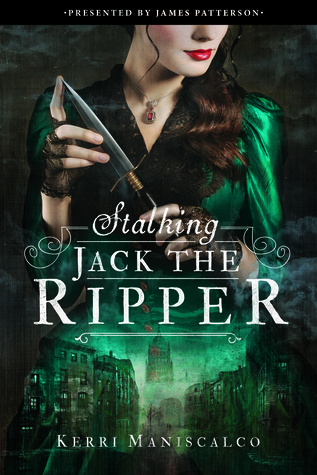 I’ve already selected one guest blogger, @EileenAndrews, so be sure to check out her website and follow her on Twitter! Oh and lastly, if you are interested in being a guest blogger, you can leave a comment here, DM me on Twitter or @reply me and I’ll be in touch. I can’t wait to see what you come up with!